John was initiated into Melrose Masonic Lodge No. 612 in 1964 where he was installed as Worshipful Master in 1975. In 1993 he affiliated to T Hay Masonic Lodge No. 685 and served as Worshipful Master in 2007. John is a Founder Member of Rosetta Lodge of Installed Masters No. 188 where he served as Secretary. In 2002 he was appointed as the Provincial Grand Master’s Standard Bearer and in 2003 as a Provincial Grand Inspector. 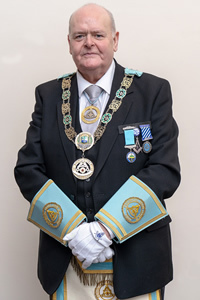 John served as Chairman of the Ballymacarrett Inspection Committee in 2006, was appointed as a Provincial Assistant Grand Master in 2008 and Provincial Deputy Grand Master in 2014. 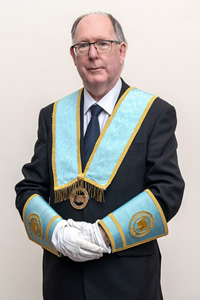 Having a keen interest in Masonic Ritual, John was examined and found suitable for admission into the Grand Lodge of Instruction in 2012 and made an elected member in 2015. In November 2018 John was Installed as Provincial Grand Master. Brian was initiated into Windsor Masonic Lodge No. 538 in the Province of Antrim in 1973 later affiliating to William Sefton Masonic Lodge No. 842 in the Province of Down in 1981 where he was installed as Worshipful Master in 1990. He also served 3 years as Treasurer, 5 years as Steward of Charities and 10 years as Almoner. Brian is also a Founder Member of Bayburn Lodge of Installed Masters No. 911 and past Chairman of Bangor District Committee of Inspection and past Secretary of Bangor Masonic Hall Committee. 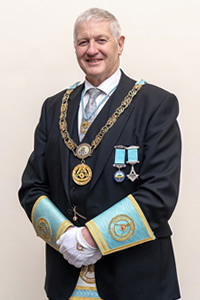 In 2007 Brian was appointed as a Provincial Grand Steward and served as Provincial Grand Secretary from 2012 until being installed as Provincial Deputy Grand Master in 2019. 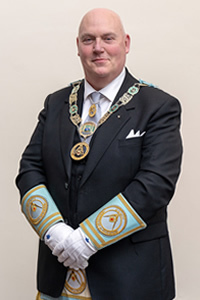 In The Grand Lodge of Ireland, Brian was invested as Grand Lodge Standard Bearer in 2016, Grand Steward in 2017 and Senior Grand Deacon in 2018. He is also the Chairman of the Northern Provinces Committee of The Grand Master’s Charity Festival ‘Vision 2020’. His current responsibilites on behalf of the Province are the Provincial Grand Lodge Secretariat, Provincial Grand Lodge Board of General Purposes, the Margaret Elizabeth Daniels Respite Fund, production of the Inspectors Handbook and Vision 2020. 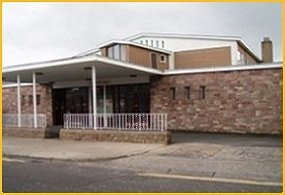 David was initiated into Charity Masonic Lodge 688 in 1989 and installed as Worshipful Master in 1995 and serving as Director of Ceremonies from 1996 to 2012. In 1996 he affiliated to Rosetta Lodge of Installed Masters served as Secretary from 2003 to 2006 and Worshipful Master in 2010. He is also an honorary member of Lodge of Charity 1551, Birmingham (English Constitution). Having a great interest in Masonic Ritual, in 2004 David was examined by the Grand Lodge of Instruction, admitted and appointed as a Provincial Instructor. He currently represents the Province of Down at the Grand Lodge of Instruction. 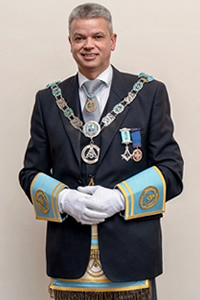 In 2005 David was appointed as a Provincial Grand Inspector and in 2006 as Provincial Grand Secretary, serving the Province in this capacity until his installation as Provincial Assistant Grand Master in 2012. 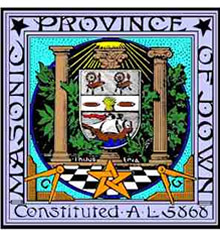 His current responsibilities on behalf of the Province are for Halls and Social Clubs, Provincial Information Officer, Provincial Website and Social Media, New Master Masons, Education and Membership. Harold was initiated into Mourne Masonic Lodge No. 696 in 1973 and installed as Worshipful Master in 1984. He also served as Director of Ceremonies from 1991 to 2000. In 1993 he was appointed as a Provincial Grand Steward and in 2002 as a Provincial Grand Director of Ceremonies. Having a great interest in Masonic Ritual, in 1996 Harold was examined by the Grand Lodge of Instruction, admitted and appointed as a Provincial Instructor. He has represented the Province at the Grand Lodge of Instruction and became an elected member in 2002. In 2012, Harold was appointed as a Provincial Assistant Grand Master. His current responsibilities on behalf of the Province are for: - Board of Inspectors, Church Services, PGL Social Events, PGL Directors of Ceremony, District Committees of Inspection. Frank was initiated into Endeavour Masonic Lodge No. 829 in 1983 and installed as Worshipful Master in 1988. He served as Treasurer and Secretary from 1989 until 2009. In 2004 Frank was examined by The Grand Lodge of Instruction, admitted and appointed as a Provincial Instructor. He is currently the Class Leader at the Holywood Class of Instruction and also represents the Province at the Grand Lodge of Instruction. 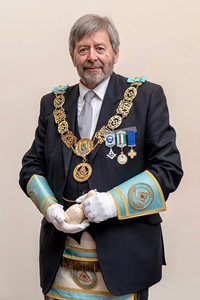 Frank was invested as Provincial Senior Grand Warden in 1999 and installed as Provincial Assistant Grand Master in 2019. His current responsibilities on behalf of the Province are District Charity Committees and The Grand Lodge of Instruction. Joe was initiated into Sharman Crawford Masonic Lodge No. 403 in 1989, installed as Worshipful Master in 2001and has served as Treasurer from 2002 to date. He is also a member of Old Portora Masonic Lodge No. 859 in the Province of Tyrone and Fermanagh. Joe served as Provincial Assistant Grand Treasurer from 2012 before being appointed as Provincial Grand Treasurer in 2013. In 2018 he was invested as the representative of The Grand Lodge of Venezuela at The Grand Lodge of Ireland. Mal was initiated into Rosemount Masonic Lodge No. 702 in 1999 and installed as Worshipful Master in 2007 and 2014. He has served as Secretary since 2015 and Almoner since 2016. In 2018 Mal was invested as Provincial Senior Grand Deacon before being invested as Provincial Grand Secretary in 2019..
Ciaran was initiated into Felicitas Masonic Lodge No. 760 in 1986 and installed as Worshipful Master in 1995. He was invested as Provincial Grand Steward in 2010 and as Provincial Grand Registrar in 2011. In The Grand Lodge of Ireland Ciaran was invested as Grand Lodge Steward of Charities in 2016 serving until 2018.